Mysterioso M-Tech is what you're looking for. Made from Polartec 4-Way Power Stretch, the inside is soft and fleecy, the outside is tightly knit, non-piling and provides warmth and wind resistance even without a shell. The Power Stretch M-Tech will provide superior insulation wet or dry and should be used as a base layer alone, under a wetsuit, or under a shell. Mysterioso garments are designed to be used as a snug fitting base layer so they are sized small and will stretch considerably. 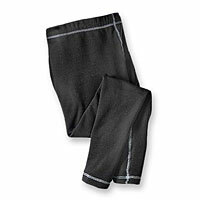 All M-Tech fabric is treated to resist growth of odor-causing bacteria. Raglan sleeves and flatlocked stitching allow freedom of movement without chafing. Please note that due to unexpected circumstances with Mysterioso, supplies will be limited and certain sizes are not available at this time. From Anonymous of Coloma, California on 3/21/2016 . From Anonymous of Fredericksburg, Texas on 3/27/2014 . From keight of Forestville, California on 3/26/2013 .